Palm trees of the sea! 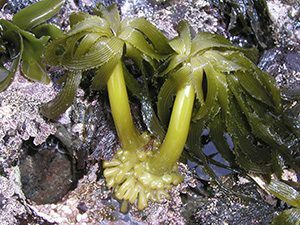 Sea Palm is one of only a few types of algae that can survive and remain standing up when out of water. Surprisingly it actually spends more of its life exposed to air than it does submerged in the ocean. Similar to any tree on land, the stipe or trunk of the sea palm also thickens as it grows and forms rings of growth! Sea palm is a protected species recreationally, but is an important harvested commercial species. Dried sea palm blades are often used in soups or eaten raw and currently sell for $24 to $30/lb. Did you know? Sea palms can reach a height of two feet and contain more than 100 blades or fronds. Although the blades are harvested for food, they can actually regenerate lost blades as long as the fishermen don’t cut too close to the stipe or trunk of the sea palm.